The Inn at Bay Harbor is a turn of the century style lakeside retreat located on the shores of Lake Michigan in Bay Harbor, Michigan. This stately hotel features the charm of days gone by from an era of vacationing by Lake Michigan but brings forth a modern day twist. This luxurious retreat has everything that should be expected of a top rated hotel, including fine cuisine, comfortable and luxurious accommodations, golf course on-site and lake views. There are various types of accommodations available to suit guests’ needs from simple yet elegant guest suites to larger, separate cottages. Stunning sunset views over Little Traverse Bay will have guests coming back year after year, not to mention the top quality customer service one will experience from the moment of reservation. 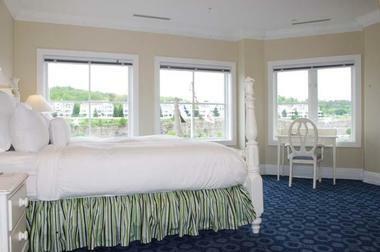 Guests will have no trouble finding a room to accommodate their needs at The Inn at Bay Harbor. The rooms/suites are located within the main hotel building and come in several configurations. 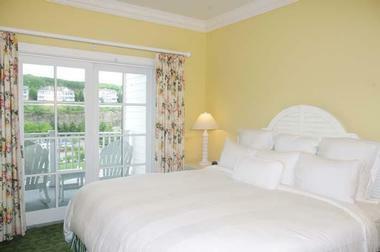 The Guest Room is a standard hotel room with two queen size beds, a balcony and approximately 440 square feet of space. This is a great option for those traveling on a budget but still looking for top quality accommodations. The Master Suite is larger, with 720 square feet and a separate bedroom with bathroom. The living room has additional sleeping which means this suite is large enough for up to four guests. Included with this suite is a fireplace and a kitchenette. The Grand Suite is perfect for up to six guests. It offers a separate bedroom with sleeping accommodations for four more people in the living room. With this suite there are two bathrooms, a fireplace and a kitchenette as well. The Quarry Suite will accommodate up to six guests as well but has a slightly different layout. There are two bedrooms plus additional sleeping space in the living room. Additionally, guests will enjoy the private covered patio and a hot tub. There are two bathrooms in the Quarry Suite as well. The Specialty Suite is meant for up to four guests and offers 1200 square feet of space. There are two bedrooms and two and a half bathrooms in this roomy suite. Guests will love the stunning views of Lake Michigan from this suite. Also with this suite comes a private covered porch, a fireplace, and a fully equipped and functional kitchen. 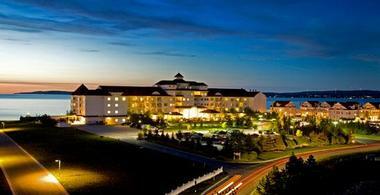 The Tower Suite has an unbelievable panoramic view of Little Traverse Bay. This incredible 2000 square foot suite will accommodate a group of eight guests with plenty of space to stretch out and relax. The parlour is the perfect place to sit and unwind in front of the fireplace, or enjoy your favorite T.V. show on the wall-mounted flat screen television. This suite comes with a fully equipped kitchen and even laundry facilities. There are two bedrooms, three bathrooms and two private covered patios. In the master bedroom there is a second fireplace and a whirlpool tub in the master bath. The Tower Suite is truly a luxurious home away from home option. The Penthouse Suite is the most luxurious, extravagant selection available with breathtaking views of Little Traverse Bay high up on the fifth floor of the Inn. This suite will accommodate up to 10 guests with its extremely roomy 3000 square feet of living space. This includes five bedrooms, five bathrooms, two private balconies which are covered so guests can enjoy even on rainy days, and a fireplace. The kitchen features deluxe appliances and is fully equipped to create tasty meals right in the comfort of the suite. Adjacent to the Inn, guests can choose to stay in one of the Lakeside Cottages. These are connected by a brick path to the Inn and are set on the shoreline of Lake Michigan. These cottages features two bedrooms and are quaint, private and cozy. Guests will have use of all the Inn’s amenities including the pool, spa, and the cabana with bar. The Cottages at Crooked Tree are another option for guests to choose for their stay. 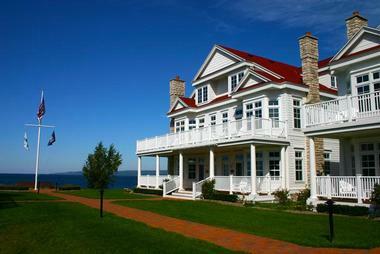 They are set atop a bluff which overlooks Lake Michigan and provides remarkable, unforgettable views of the water. These cottages feature four bedrooms and are great for families with their privacy and spaciousness. Guests staying in the cottages will have use of all the amenities available at the Inn. 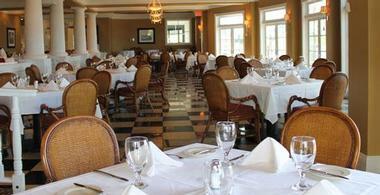 With four different dining options available, guests will never go hungry at The Inn at Bay Harbor. Guests can start off their day with a hearty meal at Sagamore’s breakfast buffet. Buffet breakfast is served every day in Sagamore’s Dining room which boasts beautiful views out over Little Traverse Bay while guests enjoy their breakfast. If a buffet breakfast is not preferable, guests can order a la carte from Sagamore’s breakfast menu. They are open daily from 7 a.m. to 11:30 a.m. The Inn Café is the perfect place to find a snack or light meal. They serve up selections such as pastries, sandwiches and even ice cream. These can be order for take-out or dining in. The café is where guests will also find Starbucks coffee and espresso. 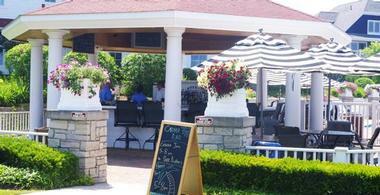 The Cabana Bar is located adjacent to Lake Michigan and serves up not only frosty cocktails, but also light lunches and snacks during the summer. Guests can enjoy their light meal poolside or in the shade of the Cabana seating. It is a laid back, casual experience reminiscent of a tropical resort. Vintage Chop House | Wine Bar offers both lunch and dinner menus. This dining option combines the classic American steakhouse with an upscale atmosphere as well as a lounge area. This is great for adults looking to relax and unwind and enjoy a delicious meal. Lunch is served daily from 11:30 a.m. to 5 p.m. and dinner from 5 p.m. to 11 p.m. Guests can choose lighter fare such as salads or burgers or something more hearty like bison pot roast or rib-eye steak. Their drink menu is extensive and offers something for every taste. Fun beach vacation ideas: East Coast Beaches, Beaches in Florida, Maui Beaches. The favorite spot for adults to retreat and unwind is Vintage Chop House | Wine Bar. The vast selection of wines, beers and cocktails means that everyone in the group will find a drink they can enjoy. Signature drinks at Vintage include View of the Bay, with Hypnotiq, rum, pineapple juice and blue curacao or the Detroit Dirty Martini with Valentine Vodka, McClure’s Pickle Brine and a pickle slice. There are many local wines to choose from as well as those from California and some imported from France or Italy. Beer and ale enthusiasts will enjoy the great selection of beers and lagers on the menu. Guests can sample local beers brewed right in Michigan and one of the many microbreweries or if not feeling adventurous, standard domestic and imported favorites are always available. When guests wish to enjoy a cocktail in the sun or by poolside, they should head to the Cabana Bar. This is set up outdoors, with views of Lake Michigan as well as being poolside. They craft frozen and slushy drinks which guests will enjoy in the warm summer air. If sitting in the sun is an issue, Cabana Bar has plenty of umbrella tables as well as a covered bar top with stools area. The Spa at The Inn at Bay Harbor will have guests feeling relaxed, revived and rejuvenated. This spa offers not only spa treatments but also salon hair and nail services. The spa treatments are for guests age 16 and up whereas the salon services are for all ages. When guests visit the spa, they will be transported to a tranquil place of calm and quiet to enjoy their chosen treatments. Cell phones are to be turned off and conversations kept at a low level. Guests can choose from a wide assortment of treatment options from many variations of massage therapy, facials, body wraps and treatments or packages which bundle different treatments together. There are spa treatments especially for expecting mothers, as well as some geared specifically towards men. For guests getting married, customized bridal spa packages can be created. In the salon, guests can enjoy having a manicure, pedicure or even hair services. It is highly recommended that guests book a spa or salon appointment ahead of their arrival to ensure availability. Golf enthusiasts will love their time at the Inn at Bay Harbor with being in close proximity to world class golf courses. Golfers can test their skills at one of several courses in the immediate area. The Links course is set on the shores of Lake Michigan and offers miles of gorgeous water views. There are dunes and bluffs to challenge golfers along the way. This course is a par 72 and is one that golfers won’t soon forget with its majestic beauty. The Preserves course is line with towering hardwood trees and is a haven for local wildlife. The green, lush grasses and wetlands set the backdrop well for an environmentally gorgeous course. Lake Michigan is close by, within earshot in fact, so golfers will enjoy the fresh sea air. This course is a par 71. Once golfers reach the final hole, they will be surprised by the view of the open shoreline. The Quarry is known for its unique layout and being a challenge to golfers. It winds its way through an actual shale quarry and has many hazards to be aware of, including 40 foot gorges, ponds and even a waterfall. This course makes its way down to finish along the shores of Lake Michigan. It is a par 71 course. For all golfers to enjoy, no matter which course they choose, is a complete service pro shop, a clubhouse offering snacks and light meals complete with outdoor seating, a practice course and even on-course beverage carts to keep golfers hydrated while they play. At select courses on Sundays guests can enjoy Family Fun Days which start at 2 p.m. 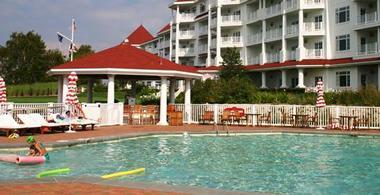 Families will enjoy the many activities and amenities of the Inn at Bay Harbor. From building sandcastles on the beach to swimming in the heated outdoor pool or even combing the sands of the beach for Petoskey stones, a vacation at the Inn at Bay Harbor will be a memorable one for all. Parents and children alike will love nearby Avalanche Bay, Michigan’s premier indoor waterpark. It has tubes and slides and tonnes of water fun. Visiting in the winter doesn’t mean kids will be short of activities to participate in either. Winter activities are available at either Boyne Highlands or Boyne Mountain for guests staying at the Inn at Bay Harbor. There is skiing, snowboarding and even dog sled rides which the kids will love. For parents looking to take a break and perhaps have a romantic dinner for just the two of them, child care is available through the hotel concierge for an additional fee. Children will be comfortable in their own suite and well taken care of while Mom and Dad enjoy some alone time. 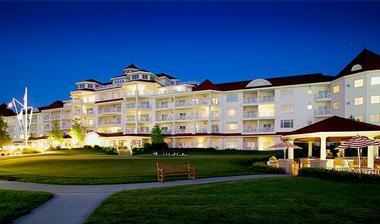 Wedding at the Inn at Bay Harbor are elegant, unforgettable affairs. The Marriott Certified Wedding Planners on staff at the Inn at Bay Harbor are a dedicated group who will work diligently to ensure each Bride and Groom experiences the day they have always dreamt of. The many venue options available will suit any style of wedding or reception, whether an outdoor sunset ceremony on the beach, a nighttime soirée under the stars or an indoor affair with stunning views of Little Traverse Bay. Brides and Grooms will rest assured that every detail will be taken care of to have their day go off without a hitch. Couples are provided with a Preferred Vendors list if they wish, to find local, reliable wedding vendors. The catering menu is one that couples will find very pleasing and will have their guests talking about the meal long after the big day. There are venues with seating for up to 200 guests. Meetings and conferences are always welcome at the Inn at Bay Harbor. With rooms and suites to suit every budget, blocking off rooms for a meeting, conference, reunion or just a group gathering will be no problem. The meeting spaces available are top notch and come with all necessary amenities to have an event run smoothly. The catering menu available provides many options for group meals and events to suit every budget and need. Along with larger banquet style spaces, there are more intimate, private boardrooms for smaller meetings or workshops or conferences. The top of the line audio and visual equipment will ensure presentations are put on seamlessly. The Inn at Bay Harbor is very happy to offer guests an extensive concierge service, which begins long before guests arrive. Guests may contact the concierge well in advance to arrange dining reservations at the establishment of their choice, to book golf tee times, and to make other reservations or plans during their upcoming stay. The concierge is also an excellent resource for guests planning out an itinerary for their stay. Local favorite eateries, attractions, events and activities can be found by inquiring with one of the concierge staff. There is a free shuttle service for guests to Petoskey Gas Light District as well as to Boyne Highlands to take part in any of the many activities.